Born in 1979. She began to be involved in performing arts when she was a student at the Nihon University College of Art. A program director at ST Spot Yokohama from 2004 to 2008. She established precog Co., Ltd in 2006 and has been the representative of the company since 2008. She has produced such projects and artists as Azumabashi Dance Crossing, chelfitsch, Nibroll, and Masako Yasumoto nationally and internationally. She launched Spectacle in the Farm, a festival held in Nasu Plateau, in 2009 and has been managing it in the executive committee. Together with Kao Kanamori (Theater products) and Teppei Fujiwara (architect), she established a NPO Drifters International in October 2009. In 2010, she took part in the opening of a communication space SNAC, which aims to create new values in the East Tokyo area, as a joint producing work by Mujin- to Production and Azumabashi Dance Crossing. Liberation from drama/theater. The three groups that I would like to introduce in this showcase are not restricted by the frame of the "place" called "theater" and have a free attitude in their creation of "drama." Tetsuwari Albatrossket composes depiction of people and their lives in marginal areas in Tokyo utilizing their repertoire of more than 1,000 short tragicomedies. akumanoshirushi transforms its director Noriyuki Kiguchi's daily labor into a performance that involves audience. contact Gonzo creates pieces out of daily happening called "contact" as if it is a thrilling fighting sport through various forms such as YouTube, photography or exhibition. Their styles re-question the expression in a place called "theater" and also liberate themselves from the present seat setting, in ways that refresh our gazes. I hope you enjoy their performances that are based on their contemplation on new forms for contemporary theatre/performance to approach the society. Born in 1976. Graduated from Kobe College. From 2001 to June 2006, she worked for the AI.HALL/ Itami Culture Foundation in Itami City, Hyogo, and was responsible for the dance programs. She became a freelance performing arts presenter in 2006 and engaged in various performances and events mainly of dance but also including theatre and music. She became a director of AI.HALL in 2008, and has been planning and producing mainly the dance programs and workshops of the theatre. I would like to introduce three performing artists/companies based in the Kansai area, who have been steadily working while incessantly renewing their unique artistic expressions. AI.HALL has been co-producing new works with them on a continuous basis through a project called "Take a chance project" (co-production with contact Gonzo is planned to start in 2011): we venture on their new challenges and emerging talents aiming to further their expressions. While pursuing cutting-edge expressions in this process, we and the artists have also been engaging in outreach toward the local people and trying to make the theater more familiar to them, seeking ways cooperation between a theater and artists can be. Born in 1978. Studied psychology at Tokyo University, Psychology and Sociology Division. After participating in a theatre company and working at a public hall, he became in 2007 the manager of Seinendan Theatre Company and Komaba Agora Theater. While producing Seinendan’s performances and Oriza Hirata’s Robot-Human Theatre project, he has also been involved in young artists’ work: the dramaturge for all the works by Shu Matsui (Sample) since 2007 and Our Planet by Yukio Shiba (mamagoto) that won the Kishida Drama Award in 2010, and the managing director of a serial performance project with six artists born in the 1980s called “The return of the 14-year- olds that restrained themselves.” A part-time instructor at J. F. Oberlin University. Is it true that only human beings can make theatre? Are the abilities that we think are unique to human beings really unique to us? Robot-Human Theatre project directly relates to the idea of "what human beings are" and urges us to renew it. In addition, a performance is at the same time, in terms of the robot study, a social experiment of which result will be utilized for the next praxis. In other words, while at this moment people see this performance from the audience seats, they are destined to be performers on the stage in the near future. 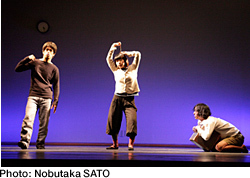 A program that explore the possibility of the creative environment of performing arts in Japan, which has been undergoing a significant change, by introducing full performances that theaters or NPOs have produced through long working processes with artists: theatre, dance, international co- production and site-specific work. Befenits are offered to TPAM Pass holders. *TPAM Direction Plus period is February 14 (Mon) and 15 (Tue). 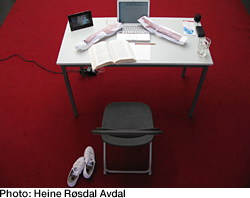 In Hot Pepper, Air Conditioner, and the Farewell Speech (2009), chelfitsch had pursued the naturalism, in order to illustrate the daily lives. In this dance work, they had put a focus on the movements of people, using them in an enlarged way. In We Are the Undamaged Others (2010), their method was pushed forward into the next level. Dimensions of time and space became more abstract in this new theater production, and they showed an example that a production can only be completed with the audience’s imagination. What will chelfitsch present to us in 2011? Please keep an eye on their endeavors. The work was honored with the prestigious performing arts award in 2008. The content is nothing to do with Ibsen. Artistic Director, Jo Kanamori says that he has created the piece to pay homage to his mentor, Maurice Be´jart. 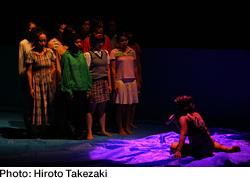 The production was re-mounted and performed in 4 cities in Japan in 2010/11 season. Questions and answers about nothingness, nonsense bodies, exaggeration and distortion of cultures, messy border-crossingness. A humorous piece by the contemporary artist Tadasu Takamine in collaboration with Thai/Japanese performers. 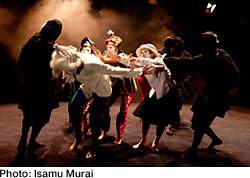 This piece was premiered at AI.HALL in 2009, updated and shown at Patravadi Theatre in Bangkok in 2010, and this presentation at TPAM is the newest and most powerful version, which is also the first presentation of Takamine’s performing arts work in the Yokohama/Tokyo area. *The door opens for two participants every 10 minutes. Staying time is up to 30 minutes. WE TAKE RESERVATION AT YCC(YOKOHAMA CREATIVECITY CENTRE) 1F. OR PLEASE CALL 090-6340-1127. Field Works - office is a location-based project, which unravels the conventions of non-theatrical spaces. Avdal and Shinozaki collaborate with sound artist Fabrice Moinet and comic book artist/performer Brynjar A°bel Bandlien. Through the use of sound displacements and cartoon-like drawings, they create a dreamy, absurd, in-between world. The Japanese premiere will take place in an architect office during their office hours, inviting Masahiro Kohama and Un Yamada as special guests. The door will open every 10 minutes for 2 spectators. The duration is 30 min. Special thanks: Steep Slope Studio, Contemporaries Co., Ltd., Yumiko Nakamura Structural Design Atelier, Kazutoshi Amano Design, Ltd.